How does water move through plants to get to the top of tall trees? Unlike animals, plants lack a metabolically active pump like the heart to move fluid in their vascular system. Instead, water movement is passively driven by pressure and chemical potential gradients. "Faultless transport system in plants is the product of an awesome design". Plants continue to evolve as a species and sustain their life form by transporting water and minerals from the roots to all parts including tips of the leaves, while defying gravity. The food made out of photosynthesis is transported from leaves to the roots, the younger top regions of the plant, the flowers and fruits. The movement of food from leaves to other parts of the plant is called translocation. Have you ever wondered how water performs its gravity-defying act of moving upward from the roots to the leaves of a plant which is very tall? What kind of pumps these trees have? Furthermore, how do plants disperse these substances, which they have taken up through their roots, i.e, send them to different regions of their bodies? What methods do they use while carrying out these difficult processes? While answering these questions, we may note that it is quite a difficult job to raise water up to heights of hundreds of meters and plants do not have circulation pump like heart in case of animals. They use two different systems – xylem moves water and solutes from the roots to the leaves, phloem moves food substances from leaves to the rest of the plant. Both of these systems are rows of cells that make continuous tubes running the full length of the plant. Xylem - Drink up; Phloem – It's alive Xylem moves water and solutes from the roots to the leaves – phloem moves food substances from leaves to the rest of the plant. Xylem vessels are involved in the movement of water through a plant - from its roots to its leaves via the stem. 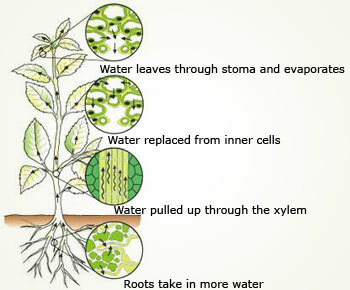 During this process, water is absorbed from the soil through root hair cells, moves by osmosis from root cell to root cell until it reaches the xylem, transported through the xylem vessels up the stem to the leaves and evaporates from the leaves. Phloem vessels are involved in translocation. 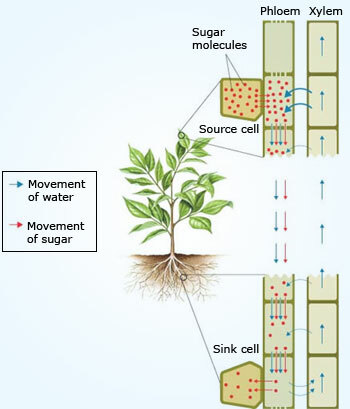 Dissolved sugars, produced during photosynthesis, and other soluble food molecules are moved from the leaves to growing tissues and storage tissues. In contrast to xylem, phloem consists of columns of living cells. The cell walls of these cells do not completely break down, but instead form small holes at the ends of the cell. The ends of the cell are referred to as sieve plates. The connection of phloem cells effectively forms a tube which allows dissolved sugars to be transported. Forces involved during water transport in plants Hydrogen bonds make water molecules stick together, a process known as cohesion. When water molecules form hydrogen bonds with other molecules, such as carbohydrates, it is called adhesion. The pulling forces and energy needed to transport minerals and water against gravity involves: free energy of the water potential gradient, free energy of evaporation, force of surface tension and force of hydrogen bonding between water molecules. Each force can be communicated to the next because water forms a strong continuous chain from root to leaf. Water moves from root to leaf because of the water potential gradient which is highest in the water surrounding the roots and lowest in the air space within the spongy parenchyma of the leaf. The energy of evaporation is needed to pull molecules away from the film of water over air spaces within the spongy parenchyma. As more molecules evaporate from the film of water molecules, the curvature of the meniscus increases which in turn increases the surface tension. Water from surrounding cells and air spaces will then be pulled towards this area to reduce the tension. Finally these forces are communicated to water molecules within the xylem because each water molecule is bound to the next by hydrogen bonds. 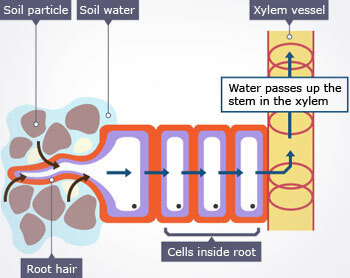 Pathway of water: From soil – roots – xylem The movement of water continues across the root hairs, into the root cells, and then enters the xylem. The xylem acts as the vessels inside the plant that carries water and minerals from the root hairs to the stem and leaves. How Water and Minerals move up? Plants do not have a metabolically active pump like the heart to move fluid in their vascular system. Water movement is passively driven by pressure and chemical potential gradients in plants through primary and secondary tissues. Water and minerals are mainly absorbed by roots, which goes upwards so as to replace water loss in transpiration and to be used in photosynthesis. Water and minerals enter through root epidermis, cross the cortex, pass into the stele, and are carried upward in the xylem. Osmosis, the movement of particles from a higher concentration to a lower concentration across a semi-permeable membrane allows water to enter the cells of the root hairs. Water enters the root hairs if the concentration of water in soil is greater than the concentration of water in the root hairs. The root endoderm has the ability to actively transport ions in one direction because of a waxy layer called subrin. The movement of water continues across the root hairs, into the root cells, and then enters the xylem. The xylem acts as the vessels inside the plant that carries water and minerals from the root hairs to the stem and leaves. This upward movement of water from roots to leaves through stem against force of gravity is called ascent of sap. The upward flow of xylem sap brings mineral nutrients to the shoot system. 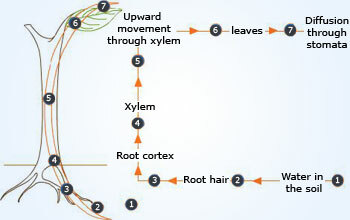 Root pressure due to concentration gradient, capillarity of xylem vessels and the transpiration pull are main forces which contribute to the upward movement of sap. The uptake of minerals by the plant is achieved by active transport, if the concentration of some minerals is greater in the root hairs than in the soil which is the growth medium. Energy is needed to make minerals travel against their concentration gradients and these minerals, once up taken by the root hairs, travel to the xylem as solutes. Water and minerals are forced up the plant through the tubes of Xylem which are narrow and hard causing water to rise through capillarity. Capillarity may be defined as the movement of a liquid up a narrow tube against the forces of gravity due to inter-molecular forces of attraction. Water is continuously pulled up the xylem tubes and carried up and throughout the plant because of transpiration pull. There is a continuous loss of water caused by transpiration in leaves, a vacuum is created which effectively pulls the water up the tubes of the xylem towards the leaves where it is lost. Leaves depend on this efficient delivery system for their supply of water. If the transpired water is not replaced by water transported up from the roots, the leaves will wilt and the plants will eventually die. 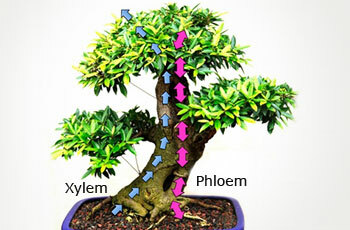 The upward flow of xylem sap also brings mineral nutrients to the shoot system. Root pressure due to concentration gradient, capillarity of xylem vessels and the transpiration pull are main forces which contribute to the upward movement of sap. The food manufactured in the leaves is dissolved in water and it flows down mainly on account of the force of gravity. Water's route of travel If once water enters the root hair, it travels from cell to cell, across the cortex, in the CELL WALLS ONLY, it is said to take the 'APOPLAST' pathway. If water passes from the cell wall through the plasma membrane to the cytoplasm, it can then travel from cell to cell through the plasmodesmata in the cell walls. This is called the 'SYMPLAST' pathway. The flow of water and minerals from the soil to the cells of the root is accomplished by transpirational pull, active transport and a special layer of cells called the casparian strip. Active transport establishes a lower water potential and helps the root hairs take in the necessary minerals dissolved in soil water. A lower water potential allows water to be drawn into the root cells by osmosis. 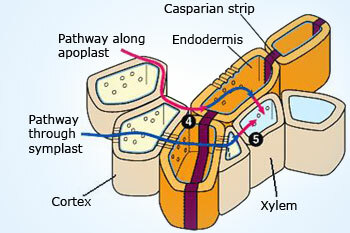 In order to regulate the quantity and type of minerals and ions reach the xylem, the root has a waxy layer between the endodermis and pericycle called the casparian strip. Water and mineral normally can travel through the porous cell walls of the root cortex which is the apoplastic route, but they need to take the highly regulated (cytoplasmic) symplastic route to reach the stele (xylem). The apoplastic route is blocked by the casparian strip. 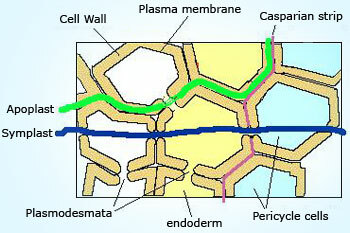 The symplastic route involves special openings between adjacent cell walls called plasmodesmata. Soil water enters the root through its epidermis and travels in the cytoplasm of root cells called the symplast, in the spaces between the cells called the apoplast and in the cells walls themselves. The inner boundary of the cortex, the endodermis, is impervious to water because of the casparian strip. Therefore apoplastic water must enter the symplasm of the endodermal cells before flowing into stele. Stele is the central core of tissue in the stem or root of a vascular plant, consisting of the xylem and phloem together with supporting tissues. Water moves within the stele freely between cells as well as through them. In young roots however, water enters directly into the xylem vessels and/or tracheids through nonliving conduits which are part of the apoplast. It crosses the plasma membrane and then passes from cell to cell through plasmodesmata. Role of endodermis in water flow Endodermis acts as a guard to filter the toxins as the plasma membrane of the endodermal cells contain many transport proteins to actively transport some molecules and filter other unwanted molecules. A key component of cellular-level transport is the movement of solutes and ions across the plasma membrane. The combination of solute concentration differences and physical pressure are incorporated into water potential, abbreviated with the Greek letter psi (Ψ). Water will flow through a membrane from a solution of high water potential to a solution of low water potential. The addition of solutes lowers water potential. Movement of water through cells happens by way of Symplastic movement and Apoplastic movement. Water flowing through the apoplast contains many minerals that the plant needs, but it may also contain toxins and substances that the plant may not want. However, since the water is flowing through the apoplast, there is no way to prevent the passive transport of these toxins, until the water hits the endodermis. Endodermis acts as a guard to filter the toxins as the plasma membrane of the endodermal cells contain many transport proteins to actively transport some molecules and filter other unwanted molecules. A long road to travel Water travels through long, thin tubes running up from the roots through the stems and leaves called xylem. Water and minerals cross the cortex by way of Symplast and Apoplast. Symplast is the living continuum of cytoplasm connected by Plasmodesmata. Apoplast is the nonliving matrix of cell walls. At the endodermis the apoplastic route is blocked by the Casparian strip which is a ring of suberin around each endodermal cell. Here water and minerals must enter the stele through the cells of the endodermis. 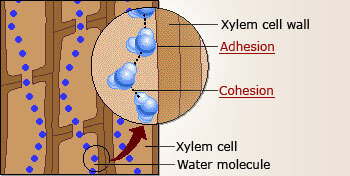 Water and minerals enter the stele via symplast, but xylem is part of the apoplast. 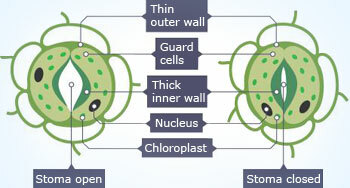 Transfer cells selectively pump ions out of the symplast into the apoplast so that they may enter the xylem. Minerals enter the root by active transport into the symplast of epidermal cells and move toward and into the stele through the plasmodesmata connecting the cells. They enter the water in the xylem from the cells of the pericycle (as well as of parenchyma cells surrounding the xylem) through specialized transmembrane channels. In the xylem, water along with the minerals move up in the vessels and tracheids. The water can leave the xylem and pass laterally to supply the needs of other tissues. At the leaves, the xylem passes into the petiole and then into the veins of the leaf. Water leaves the finest veins and enters the cells of the spongy and palisade layers. Here some of the water may be used in metabolism, but most is lost in transpiration. TACT forces are responsible for water uptake from roots to tip of the leaves These TACT forces are: Transpiration, Adhesion, Cohesion and Tension. 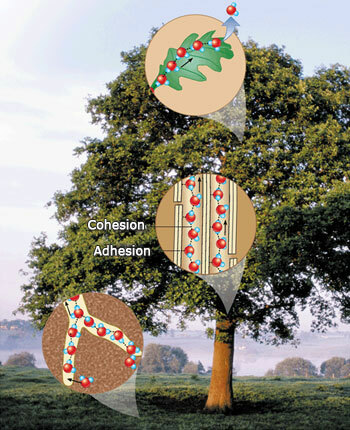 These forces combine to transport water solutions from the roots, through the xylem and into the leaves. Four important forces combine to transport water solutions from the roots, through the xylem and into the leaves. These TACT forces are: Transpiration, Adhesion, Cohesion and Tension. Transpiration involves the pulling of water up through the xylem of a plant utilizing the energy of evaporation and the tensile strength of water. Adhesion is the attractive force between water molecules and other substances. As water and cellulose (cell wall component of plants) are polar molecules there is a strong attraction for water within the hollow capillaries of the xylem. Cohesion is the attractive force between molecules of the same substance. Water has an unusually high cohesive force again due to the four hydrogen bonds each water molecule potentially has with any other water molecule. It is estimated that water's cohesive force within xylem give it a tensile strength equivalent to that of a steel wire of similar diameter. A combination of adhesion, cohesion and surface tension allow water to climb the walls of small diameter tubes like xylem and this is called capillary action. Tension can be thought of as a stress placed on an object by a pulling force. This pulling force is created by the surface tension which develops in the leaf's air spaces. As water molecules leave the surface film by evaporating into the air spaces the remaining film forms menisci which become more and more concave. A meniscus has a tension that is inversely proportional to the radius of the curved water surface.. "Tension is a negative pressure that pulls water from locations where the water potential is greater. Water has strong adhesive and cohesive properties due to which loss of water is replaced by water clinging to the inside of the cell walls. This creates a tension on the water in the xylem and gently pulls the water toward the direction of water loss. The cohesion of water is strong enough to transmit this pulling force all the way down to the roots. Adhesion of water to the cell wall also aids in resisting gravity. The water column in the tallest trees can be 100m as the tension created by evaporation of water coupled with the cohesive and adhesive forces is enough to support this column against the forces of gravity. At night, transpiration is almost nil. However, the root cells continue to actively transport minerals into the root stele consisting of the xylem and the phloem. This active transport lowers the water potential within the stele and water flows into the roots, pushing the water up against gravity. 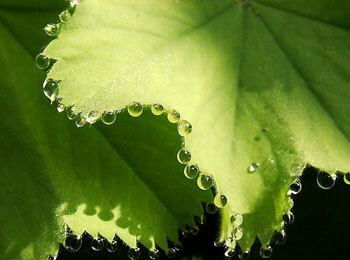 Water that reaches the leaves is often forced out, causing a beading of water upon the leaf tips known as guttation.. In most plants, however, root pressure is not the primary mechanism for transporting the xylem. Evaporation from leaves is responsible for transpiration pull Evaporation from the mesophyll cells produces a negative water potential gradient that causes water to move upwards from the roots through the xylem, thus creating transpirational pull. The bulk flow of water to the top of a plant is driven by solar energy since evaporation from leaves is responsible for transpiration pull. Evaporation from the mesophyll cells produces a negative water potential gradient that causes water to move upwards from the roots through the xylem. Evaporation inside the leaves occurs predominantly from damp cell wall surfaces surrounded by a network of air spaces. Driven by the sun's energy to break the hydrogen bonds between molecules, water evaporates from menisci, and the surface tension at this interface pulls water molecules to replace those lost to evaporation. This force is transmitted along the continuous water columns down to the roots, where it causes an influx of water from the soil. Scientists call the continuous water transport pathway as - Soil Plant Atmosphere Continuum (SPAC). Xylem sap rises against gravity, without the help of any mechanical pump, to reach heights of more than 100m in the tallest trees. Photosynthesis – Transpiration compromise In order to carry out photosynthesis, a plant needs to open it's stomata to exchange gases. It turns water and carbon dioxide into glucose. Opening the stomata, though, causes the loss of water. This evaporation causes water to be pulled up from the soil (transpiration). 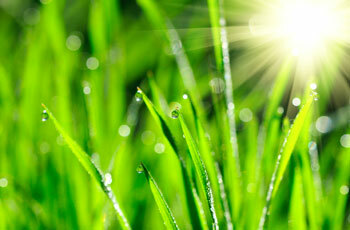 Water is needed for photosynthesis and is lost as a product of obtaining carbon by this very same process. The efficiency of a plant can be measured by its transpiration-to-photosyntesis ratio which is the ratio of amount of water lost per gram of CO2 assimilated into organic material created by photosynthesis. A typical ratio for a C3 plant is 600:1 - for a typical C4 plant (C4 pathway) is more like 300:1. 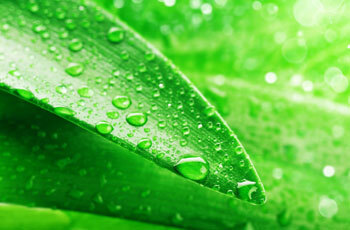 As long as plants can pull water from the soil as fast as it leaves from the leaves, there is no problem. The efficiency of photosynthesis increases as the surface area for CO2 increases. This is the purpose of the spongy mesophyll which is honeycombed with air sacs and has 10 to 30 times more surface area than the corresponding external surface of a leaf. Photosynthesis is limited by available water which can be swiftly depleted by transpiration. It has been estimated that for every gram of CO2 fixed by the Calvin cycle, anywhere from 300 to 600 grams of water escape through transpiration. The humidity of rainforests is due in large part to this vast cycling of water from root to leaf to atmosphere and back to the soil. Plants can slow down the transpiration rate by closing some of their stomata If the loss of water is faster than the rate at which it is being replaced by the roots, then plants can slow down the transpiration rate by closing some of their stomata. This is regulated by guard cells, which lie on either side of a stoma. Water loss by a plant through stomatal openings is known as transpiration. Transpiration causes supply of water for photosynthesis, transports minerals from the soil to all parts of the plant, cools leaf surfaces some 10 to 15 degrees by evaporative cooling and maintains the plant's shape and structure by keeping cells turgid. Measurements reveal that the forces generated by transpiration can create pressures up to 12 atmospheres, sufficient to lift a xylem sized column of water over 350 feet high (130 meters). Water is constantly taken from the top of the xylem vessels and the rate of transpiration is affected by many factors such as: temperature, wind-intensity, humidity, and light-intensity. Factors that speed up transpiration will also increase the rate of water uptake from the soil. If the loss of water is faster than the rate at which it is being replaced by the roots, then plants can slow down the transpiration rate by closing some of their stomata. This is regulated by guard cells, which lie on either side of a stoma. If the guard cells are turgid, then they curve forming ‘sausage-shaped’ structures with a hole between them opening the stoma. However, if the guard cells are flaccid due to water loss, they shrivel up and come closer together, closing the stoma. 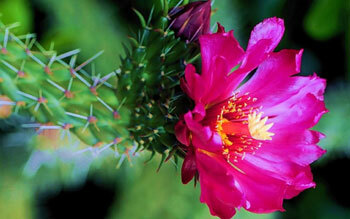 This in turn reduces the water loss due to transpiration, and can prevent the plant from wilting. In succulent plants the stomata behave opposite what is normal That is, they are closed during the day and open at night. As a result, the loss of water (transpiration) during the hot, dry daytime hours is minimized. The rate of photosynthesis is measured using an instrument called photometer. Light intensity stimulates stomata opening and results in increase of rate of photosynthesis. Photosynthesis requires gaseous exchange and the stomata is the pore in which gaseous exchange takes place. Plants transpire faster at higher temperatures as the rate of evaporation increases with temperature. Water on the surface of spongy and palisade cells (inside the leaf) evaporates and then diffuses out of the leaf. Plants growing in dry conditions adapt by reducing transpiration loss with the help of thick cuticles which prevent water loss from epidermal cells, succulent leaves which store water and by loss /reduction of leaves as photosynthesis can be carried out by the shoot. White leaves/spines - light colors reflect light and heat, thereby cooling the plant. Trichomes (hairs) create a more humid microenvironment to reduce evaporative water loss. Bidirectional flow of food in phloem cells The movement of water and dissolved minerals in xylem is always upward from soil to leaves, but the movement of food can be upward as well as downward depending upon the needs of the plants in phloem. Leaves make food by the process of photosynthesis. The food made by leaves is in the form of simple sugar (glucose) while other types of substances called plant hormones are made in the tips of roots and shoots. The prepared food is transported from the leaves to the roots and all parts of the plant through phloem which translocates the food and other substances. Phloem consists of sieve tubes and companion cells. Sieve tubes are living cells which contain cytoplasm but do not have nucleus. So its function is supported by companion cell as each sieve tube has a companion cell next to it. Food, primarily sucrose is transported by the vascular tissue called phloem from a source to a sink. Unlike transpiration's one-way flow of water sap, food in phloem sap can be transported in any direction needed so long as there is a source of sugar and a sink able to use, store or remove the sugar. The source and sink may be reversed depending on the season, or the plant's needs. Sugar stored in roots may be mobilized to become a source of food in the early spring when the buds of trees need energy for growth and development of the photosynthetic apparatus. Phloem sap is mainly water and sucrose, but other sugars, hormones and amino acids are also transported. The movement of such substances in the plant is called translocation. The movement of water and dissolved minerals in xylem is always upward from soil to leaves, but the movement of food can be upward as well as downward depending upon the needs of the plants. Thus, this faultless transport system in plants is the product of an awesome design. Illustrating Pressure-flow hypothesis The pressure flow hypothesis of food movement states that dissolved sugars flow from sources and are released at sinks where they are used. This means that dissolved sugars enter the phloem at sources (such as the mesophyll layer of leaves) and move through the phloem until they reach a sink (such as a growing root) where they are needed. The accepted mechanism needed for the translocation of sugars from source to sink is called the pressure flow hypothesis. According to the "Pressure-Flow Hypothesis", water and dissolved sugars flow through the sieve tubes from an area of higher pressure to an area of lower pressure. The cells in the leaf export sugars into the phloem cells by active transport. The resulting high concentration of sugar causes water to diffuse into the phloem cells, increasing the water pressure there. This area of higher pressure forces the sugar-water solution to move into the next phloem cell. In this manner, sugars are moved from cell to cell. As the fluid is pushed down (and up) the phloem, sugars are removed by the cortex cells of both stem and root (the "sinks") and consumed or converted into starch. Active transport is necessary to move the sucrose out of the pholem sap and into the cells which will use the sugar -- converting it into energy, starch, or cellulose. 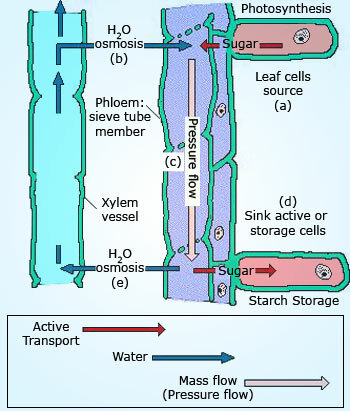 As sugars are removed osmotic pressure decreases and water moves out of the phloem. Finally, relatively pure water is left in the phloem, and this leaves by osmosis and/or is drawn back into nearby xylem vessels by the suction of transpiration-pull. Thus it is the pressure gradient between "source" (leaves) and "sink" (refer to areas in the plant that store or use sugars - shoot and roots) that drives the contents of the phloem up and down through the sieve elements. The movement of sugars in the phloem begins at the source, where (a) sugars are loaded (actively transported) into a sieve tube. Loading of the phloem sets up a water potential gradient that facilitates the movement of water into the dense phloem sap from the neighboring xylem (b). As hydrostatic pressure in the phloem sieve tube increases, pressure flow begins (c), and the sap moves through the phloem. Meanwhile, at the sink (d), incoming sugars are actively transported out of the phloem and removed as complex carbohydrates. The loss of solute produces a high water potential in the phloem, and water passes out (e), returning eventually to the xylem. 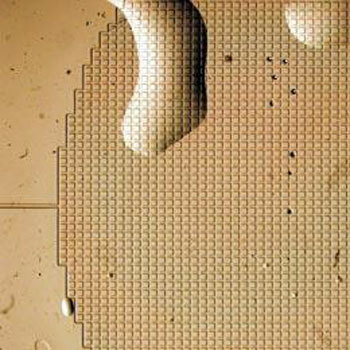 Tree on a chip' mimics water transport in plants. Researchers have created a synthetic "tree" - a centimeter-sized hydrogel with nanopores that can pull water just like real trees pull moisture up their tall trunks. Understanding how the process works could allow researchers to use it for several human applications. One idea is to develop a new kind of passive heat-transfer technology to heat buildings. For instance, a solar collector on the roof could heat a fluid, which could be distributed by gravity to lower parts of the building. Then the fluid could be recycled back up to the roof using the transpiration technique. "World's first synthetic tree – Inspired by Plant transport mechanism." Understanding these processes is central to agricultural advancement. Modeling studies in ideal growing conditions indicate that it is not photosynthesis that limits yield, but rather the ability to transport sugars. Thus, genetic engineering of higher-yielding crop plants may depend on a better understanding of factors that limit bulk flow of sugars. This is just one example of how basic plant research connects to agricultural technology. For example; more recently, an evaporative flow system based on negative pressure has been reproduced in the lab for the first time by a 'synthetic tree' (Wheeler & Stroock 2008). 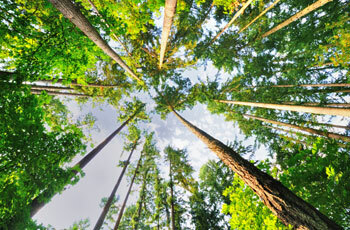 World's first synthetic tree is no giant redwood, but may lead to technologies for heat transfer, soil remediation etc. By building mimics of xylem capillaries within the gels, the scientists were able to create negative-pressures of the magnitude observed in trees, and to pump water against large resistances and out of sub saturated, or partially dry, sources. Besides supporting the theory of transpiration as a physical, not biological, process, the synthetic tree also introduces a new way to study water under tension -- a subject interesting to physicists and chemists.